First it was Dunkin Donuts, and now it&apos;s Shake Shack. The East Coast overlords have been slowly making their mark throughout Los Angeles, and our city will now be blessed with not one, but two Shake Shack locations. Reps for the burger chain, which often gets compared to In-N-Out in East Coast vs. West Coast burger battles, confirmed to Eater LA that the second outpost opening late next year will be in Glendale, across the street from the Americana at the Brand. 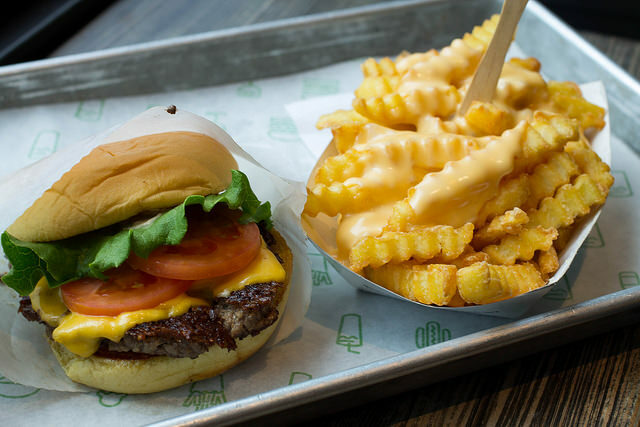 In April, Shake Shack announced that they would be opening a location in West Hollywood in 2016, and said we could expect on their menu their all-natural burger patties, hot dogs, crinkle-cut fries and frozen custard. While the location is under construction right now, they&apos;ve livened up the currently drab site by commissioning Danish artist Thomas Dambo to create a colorful, interactive art installation along the construction wall, dubbed The Happy Wall. Dambo installed 1,664 wood pixels on spinners in various colors earlier this month, allowing passersby to flip the pixels to make their own art, design or have it spell out words. Come on, get happy! No one wants to look at a boring construction site, so we&apos;ve commissioned Danish artist @thomasdambo to construct his Happy Wall around the future site of our first LA Shack. We invite all our LA fans to stop by the interactive public art project, flip the tiles, and dream up imaginative messages and pictures. We want to see &apos;em! Share your creations with #happywall and #shakeshack. Shake Shack has been expanding across the country recently. At the end of last year, they opened new locations in Chicago and Las Vegas.